Need a Valentine? We Can Help! Just a quick post to point out the many beautiful flowers in the greenhouse. 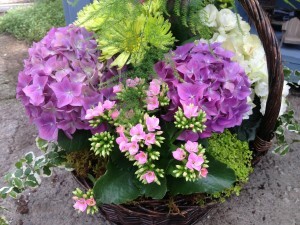 Our baskets and containers are one of a kind…special creations custom made for each order. 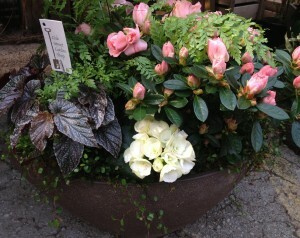 If you have a basket, bowl, or other container you’d like us to fill with beautiful plants, just bring it in and we’ll take it from there, or choose one of ours. Valentine’s Day is this Saturday, so get your order in soon! Some of the many blooming plants we have in now, or will be getting in this week, include cyclamen, campanula, primroses, rieger begonias, narcissus, violets, orchids, hydrangeas, hyacinths, freesias, azaleas, and more. Stop in to browse or give us a call to place an order for pick up or delivery. 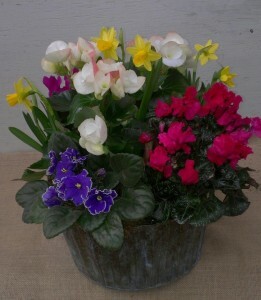 This entry was posted in Arrangements, Baskets, Container, Flowers and tagged arrangements, color, cyclamen, flowers, gifts, hydrangeas, narcissus, orchid, primroses, Valentine's Day, violets on February 9, 2015 by Kris Blevons. Look at all the different flowers Jamie used here…and not any of them cut! This time of year is a transition period in the nursery and the greenhouse, and, quite honestly, we’re ready for the change of seasons. 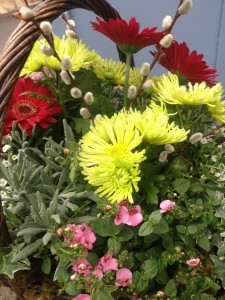 What goes into pretty plantings for parties and gifts is changing too. 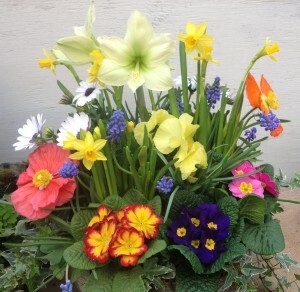 We’re nearing the end of the late winter primroses, forced bulbs, and pansies and looking forward to all the spring flowers to work with next. 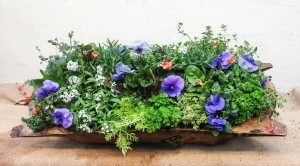 Before we move on, though, I wanted to bring you some of the things we’ve been doing – from a dough bowl filled with flowers and herbs to glazed pots with pretty blooms, a simple green pot with beautiful foliage, and one made with lichen branches wired together to create a container. There’s always something to create, and what fun it is! None of the flowers we use are cut. 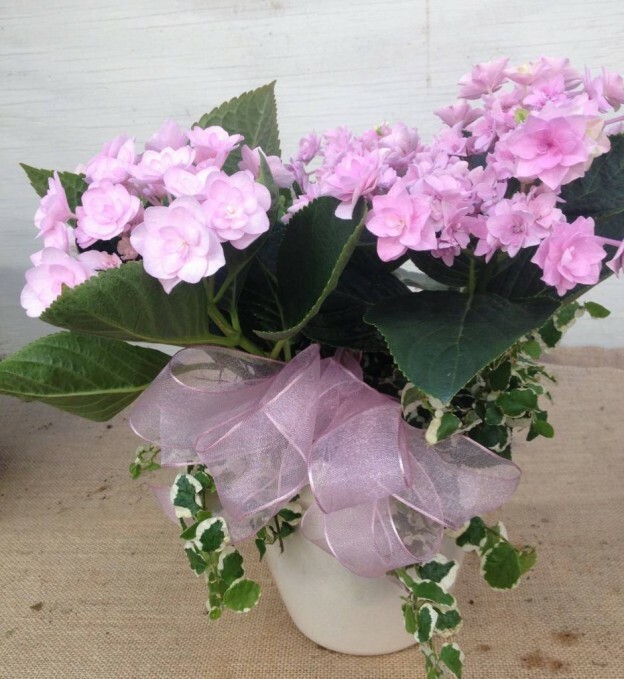 We work with live plants, so the longevity is much better than a fresh flower arrangement, and, as an added bonus, many of the plants can be used outside, either in containers or in the ground when it’s time to take the whole thing apart. 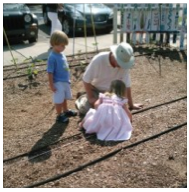 Think lettuce, herbs and forced bulbs planted in the garden! 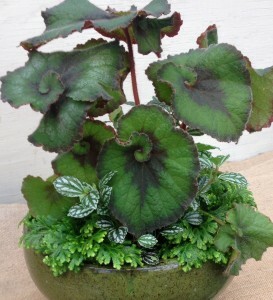 A planting that will continue to grow, either in the house or on a bright porch once the weather warms, is this green glazed bowl, filled with a rhizomatous begonia, an aluminum plant and some selaginella. It would be a pretty addition for Saint Patrick’s Day! And here are the lichen branches I wired and glued together to make a container. When the primrose is played out, another plant can easily be slipped into its spot with the frosted selaginella and creeping jenny…or an entirely new planting could be created! We have quite a few of these lichen branches that Jamie found and that we’re playing with. 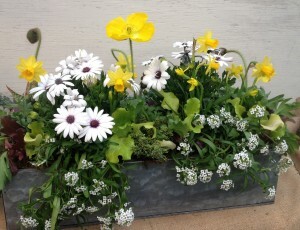 If you’d like us to incorporate something like this into one of your planters, let us know. Finally, here’s a teal pot, filled completely with pretty blooms. Soon these flowers won’t be available, but by then we’ll be ready to move on to a new season and more creative possibilities. 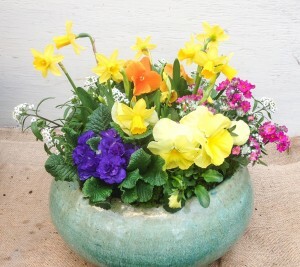 For now, though, it’s enough to have spring in a pretty bowl – and who wouldn’t like that? 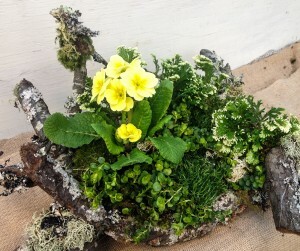 This entry was posted in Arrangements, Container, Flowers, Gifts, Herbs and tagged arrangements, containers, dough bowl arrangment, flowers, glazed bowl arrangement, lichen branch arrangement, primroses on March 8, 2014 by Kris Blevons. 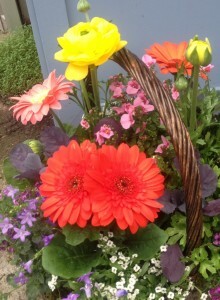 More Arrangement Inspiration – What We’ve Been Creating This Summer! This summer’s wet, cool weather might have kept many of you out of your gardens, but we’ve managed to stay busy in the greenhouse putting together arrangements filled with orchids, succulents, houseplants, and so much more…here’s a peek at some of them. We regularly have folks who stop in just to see what we’ve been working on! 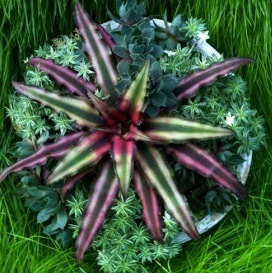 All of these arrangements are composed of live plants, no cut flowers here. 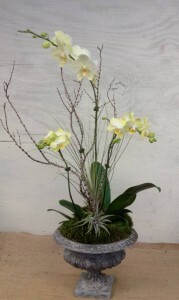 Orchids add elegance to any container, and we love working with them. Here, the beautifully patterned leaves of a calathea contrast with the dark selaginella trailing over the edge. 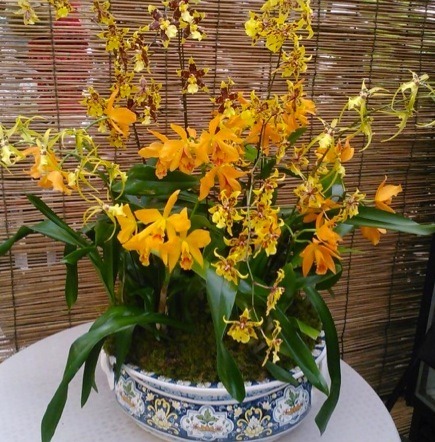 The houseplants shown with the orchid are actually planted in the container to make the care easier – our advice is always to feel where the plant is in the arrangement and water a bit when dry. Of course, some plants will need more or less water than others. 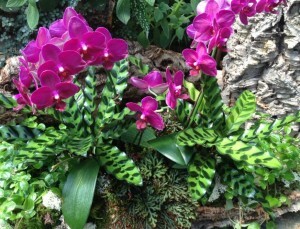 For example, orchids last longest when they’re not overwatered! 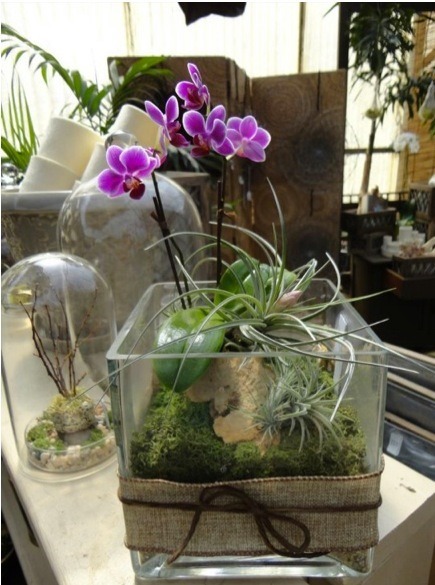 The terrarium arrangement shown here was presented as a going away gift and was planted using pebbles, larger stones as accents, soil and aquarium charcoal to keep the potting soil fresh. Here the care will again be to monitor the soil moisture carefully and water when it’s completely dry. 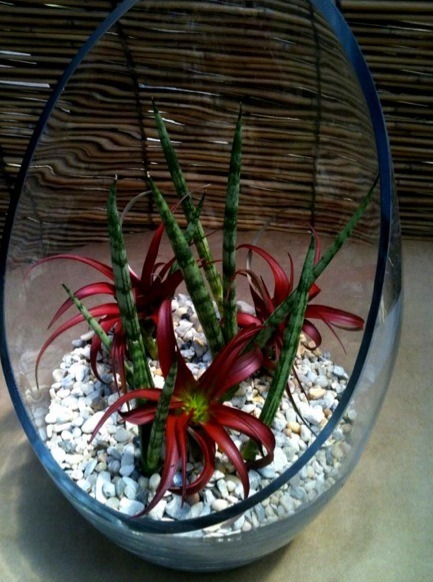 The various leaf textures and colors of the succulents in the glass container make this arrangement interesting. 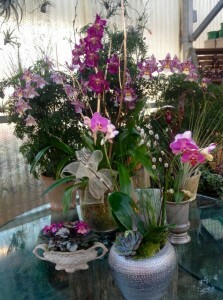 As you can see, we’ll put orchids in just about any container and with just about any plant! 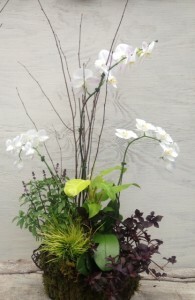 In fact, the next arrangement shown uses a combination of houseplants, herbs, annuals and perennials with orchids. It was one of a pair used for a wedding anniversary celebration. So the celebrants were able to continue to enjoy the arrangement even after it was taken apart. Hopefully the Thai basil went in containers or the herb garden, and the perennial miniature grass-like acorus and purple leaf trailing annual irisene found new homes in the garden as well. Finally, the silver container was given in memory of someone…the longlasting and low maintenance houseplants of trailiing pepperomia and cryptanthus make excellent companions. It’s gratifying, also, to know that whoever is on the receiving end will be able to enjoy this longer than a fresh flower arrangement could ever hope to last. We’re looking forward now to a new season, with fall right around the corner, and a whole new world of possibilities for creative arrangements – we’ll keep you posted. Meanwhile, if you’re in Birmingham, stop in – there’s always something going on in our design area! 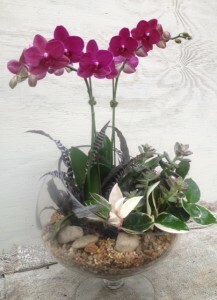 This entry was posted in Arrangements, Container, Flowers, Indoor Plants, Orchids, Succulents, Summer, Terrariums and tagged containers with mixed flowers, flower arrangements, flowers, orchid arrangements, succulent arrangements on August 24, 2013 by Kris Blevons. 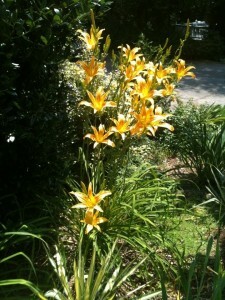 Summertime is day lily time! 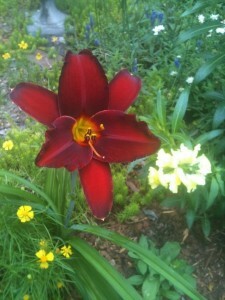 This ‘Siloam Double Classic’ daylily’s first bloom in my garden marks the beginning of summer for me. Blooming right around Memorial Day, it is also a reliable rebloomer and the last to bloom at the end of summer – August 22nd last year, to be exact! Blooms aside, daylilies also add another important element to a garden, particularly in a mixed perennial/annual bed – foliage form. We talked about the importance of foliage in the garden in an earlier post on perennials…the fountain like leaves of large daylilies can break up the monotony of masses of other plants, and the lily bloom can be placed in contrast to other flower shapes as well. 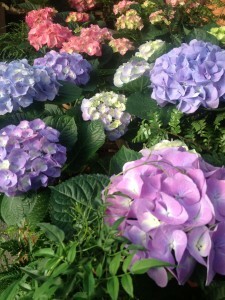 Summer is the season for these lovely plants, and the best selection will be available in the coming days and weeks. 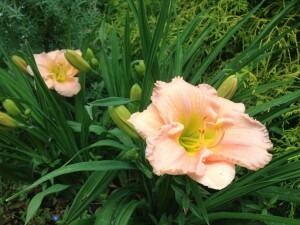 After you’ve chosen and placed your daylilies, don’t forget about them. 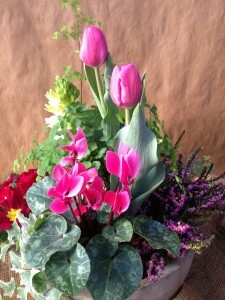 They benefit from an (at least) weekly walk through the garden, to pick off faded blooms. If any leaves are yellow, pull them out as well, to keep plants looking well tended. Once the bloom period ends, cut the old bloomscapes completely to the ground, tidying the plant. If the leaves begin to look tattered at all, don’t hesitate to take the entire plant and cut all the foliage back by half. Your daylilies will reward you with fresh foliage the rest of the season, and, if they’re rebloomers, you’ll have another round of flowers! 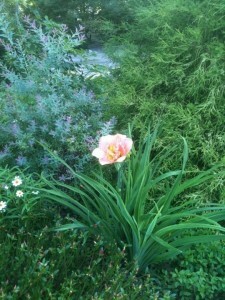 Divide your daylily when it becomes too large for its spot. This is best done on a pleasant fall day after the heat of summer has finally passed…this chore will be the subject of a future post. This entry was posted in Bedding Plants, Flowers, Native plants, Perennials and tagged day lilies, day lily, daylilies, daylily, flowers, foliage, perennials, reblooming on May 28, 2013 by Kris Blevons. 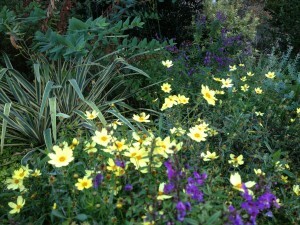 A mainstay of perennial gardens, many of us have a love/hate relationship with coreopsis. Other than the native species, many seem to be difficult for folks here. The taller, earlier ones need constant deadheading to look their best, and the smaller flowered, wispy foliaged (verticillatas) need cutting back as soon as their initial bloom is done to keep them looking neat. A couple of years ago I bought this coreopsis for the shop, hoping the flower color and the plant would work well here. I’m happy to say it has been an absolutely wonderful addition to my hot, sunny front bed, consorting quite happily with roses, daylilies, Mexican sage, rosemary, yucca (Yes, it’s very hot! 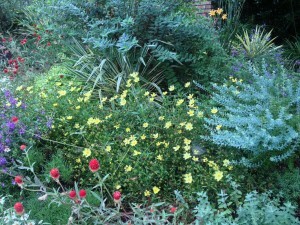 ), gaura, green santolina, mecardonia, Mexican heather, and various other heat loving plants. In fact, I sent pictures of it in various stages through the summer to one of my local growers, and, with each picture, a note saying, “Please grow this so I can pass it along to other Birmingham gardeners!” Well, I’m very happy to say she did, and we have Coreopsis ‘Full Moon’ available from our local wholesaler right down the road in Alabaster! I honestly can say this Coreopsis ‘Full Moon’ bloomed in my garden from June through the hottest part of summer and only started to wane in August – an unbelievable bloom time for a perennial. The color is a soft, buttery yellow like ‘Moonbeam’ coreopsis, but the foliage is more substantial and the flowers themselves are much larger.These are available now if you’d like to try one or more! 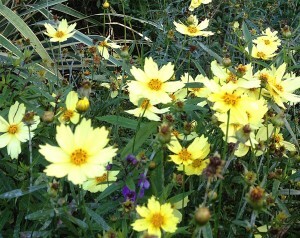 Coreopsis ‘Full Moon’ is a winner! Tip: A great way to get even longer bloom from a perennial like this is to cut it back by half early in the season, and even better is to cut half of your plants back by half. That way the stems that haven’t been cut back bloom first. Those you cut back will bloom a bit later, thus extending your bloom period. 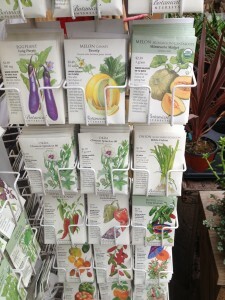 Look at this post for more information on this technique – happy gardening! 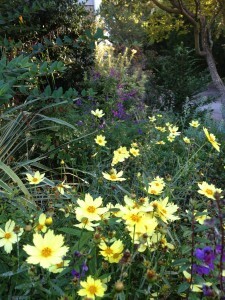 This entry was posted in Flowers, Perennials, Summer, Uncategorized and tagged 'full moon', coreopsis, flowers, perennial on April 8, 2013 by Kris Blevons. 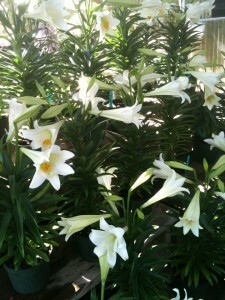 Easter Flowers – Lilies and More! We love the colors, blooms and scents of the Easter holiday…from pure white Easter lilies to the soft purples and pinks of hydrangeas, and the fragrance of stephanotis…this season speaks of new beginnings..
With the upcoming holiday and family and friends gathering for Easter, we have the plants, flowers and arrangements for your table or gifts for loved ones at this special time. We also have beautiful hydrangeas…while these are considered florist hydrangeas, for you folks that want to try planting them out in your landscape find a spot with filtered sun, rich soil and a bit of protection. 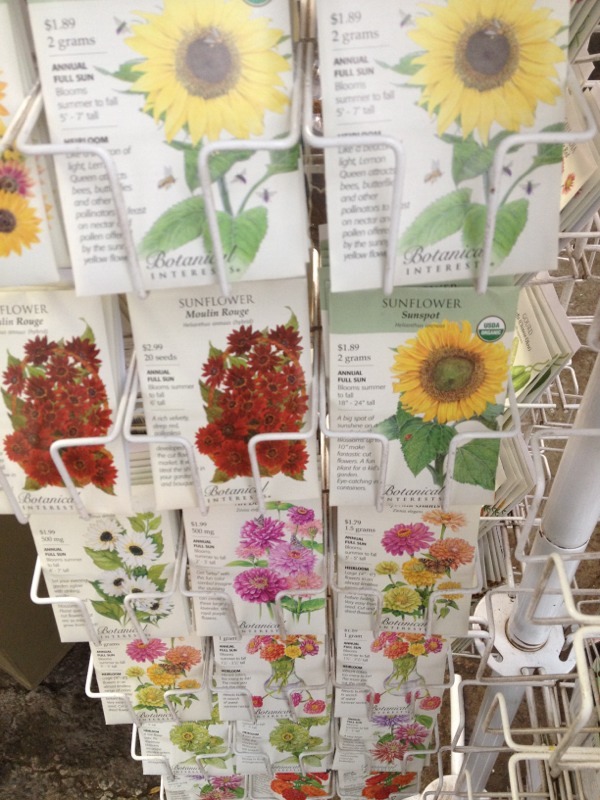 Keep them well watered their first summer in the ground. The fragrant stephanotis wreaths are beautiful annual vines…they will bloom now and sporadically through the summer – they’re very nice in planters with other blooming summer annuals. They aren’t winter hardy though, so if you’d like to keep them be sure to bring them in for the winter. 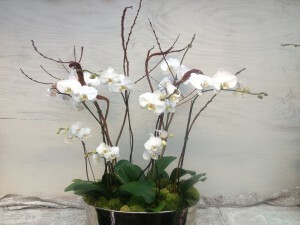 Of course we also have long lasting and elegant orchids – let us arrange a grouping in one of your containers or ours. 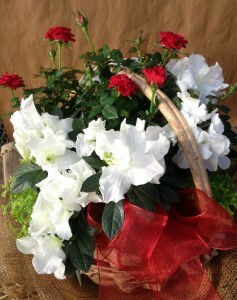 In addition to gorgeous orchids we also offer kalanchoes, violets, freesia, campanula, calla lilies and more! 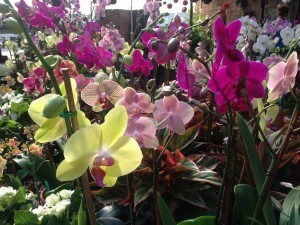 We always have the most beautiful orchids! 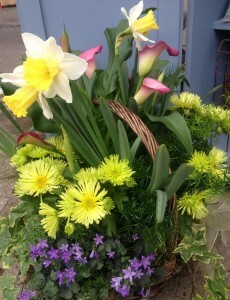 If you’d rather have an Easter arrangement or basket made up of plants that you can use later in your garden and seasonal planters, we have that as well! Just let us know and we’ll offer appropriate suggestions for you. From all of us, we hope all of you have a wonderful Easter ! 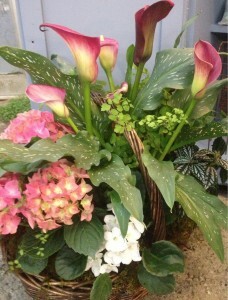 This entry was posted in Annuals, Arrangements, Baskets, Container, Flowers, Holiday, Orchids and tagged arrangements, containers, easter, easter lilies, flowers, holiday, hydrangeas, planters, stephanotis on March 22, 2013 by Kris Blevons. 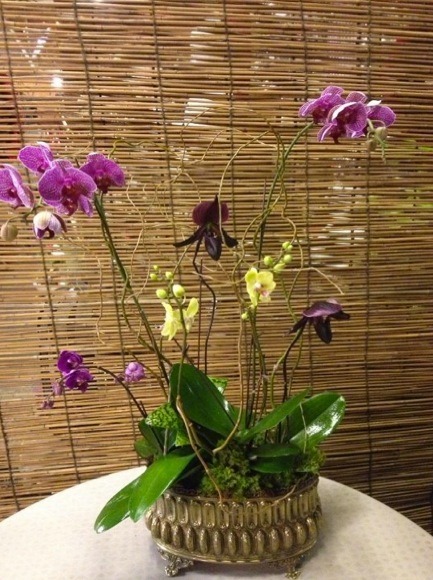 Orchids: These Arrangements Add Drama! What a nice surprise to have our work recognized by garden writer Steve Asbell of The Rain Forest Garden in his latest blog. We know many of you come to us for creative and unique arrangements, and here is a sampling of some of what we do with orchids and other flowers every day – we offer the photos from his website here as well, and urge you to go to his blog to read the nice piece about us in addition to other great posts and information – thanks for the recognition Steve! 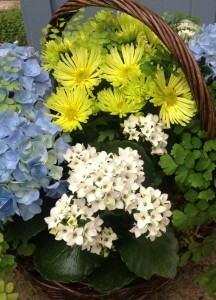 He also posted pictures of these arrangements! So, you say you need to add some drama to your life? We’ll be happy to oblige! 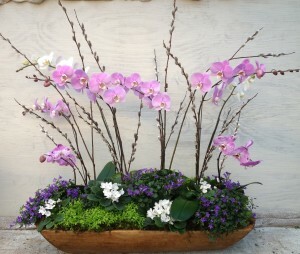 This entry was posted in Arrangements, Container, Flowers, Orchids, Uncategorized and tagged arrangements, containers, flowers, orchid, Steve Asbell on February 22, 2013 by Kris Blevons. Just had to post one more Valentine’s Day teaser because there are so many beautiful flowers in the greenhouse….the baskets and containers we’ve done are one of a kind – we don’t do any cookie cutter arrangements – ever. 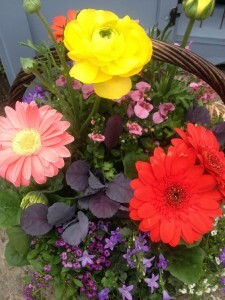 Remember too, if you have a basket, bowl or other container you’d like us to fill with beautiful plants, just bring it in and we’ll take it from there. Some of the blooming plants we have in now include tulips, cyclamen, campanula, primroses, rieger begonias, narcissus, roses, violets, amaryllis, orchids, hydrangeas, pansies, hyacinths, heather, bromeliads and more! So much color and such beauty surrounds us! This entry was posted in Arrangements, Baskets, Container, Flowers and tagged arrangements, bromeliad, color, flowers, gifts, narcissus, orchid, pansies, primroses on February 9, 2013 by Kris Blevons.